With autumn clearly here and Halloween fast approaching, never has it been a more apt time for another set of ghost stories. 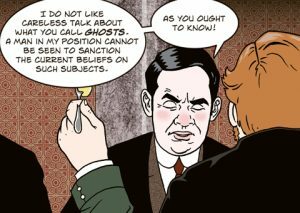 We absolutely loved SelfMadeHero’s first adaptation of Ghost Stories of an Antiquary by M R James, adapted by John Reppion and Leah Moore. 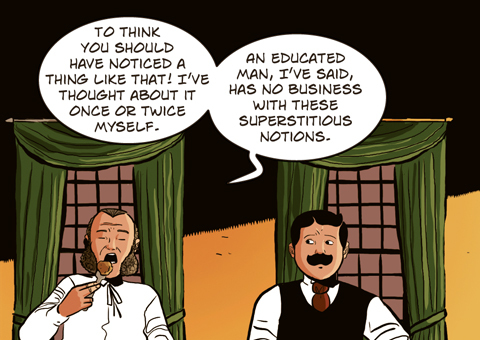 So when the opportunity arose to cover vol.2 following several new stories from the legendary ghost story writer James himself, we simply couldn’t wait to see how these new beloved tales fit the medium of the graphic novel. James’ classic trope of a knowledgeable man of academia (usually somewhat arrogant) inadvertently ‘releasing’ something from the depths of a nightmare is clearly nothing new. However James’s skill in building the terror and making each one stand apart so well is evidently what makes them so effective all these years on. Vol.1 showed a unique retelling of these classic stories which many will know well from the ‘Ghost Stories of Christmas’ TV adaptations. This time round with Vol.2 a whole new set of ghostly tales have been revisited and adapted to the graphic novel medium. If anything Vol. 2 has surpassed vol.1 in adapting James’s classic tales to the graphic novel medium. With arguably a host of even more effective stories this time round with ‘Number 13’, ‘Count Magnus’, ‘The Treasure of Abbot Thomas’ and the beloved ’Oh Whistle and I’ll Come to you My Lad’. First up with the well known ‘Number 13’ following a visiting academic to the Dutch town of Viborg, who’s evenings are plagued by the noises emanating from a room which might or might not exist in his hotel. The mysteriousness of the vanishing room itself is well used within the panelling by illustrator George Kambadais. The surreal depictions of the ‘fiends within the wall’, a stark contrast from the clean lines of Mr Anderson’s daily life. The use of light and colour set apart the unreality of these evenings against the daily life of Mr Anderson, something which is used very well. Next up, the adaptation of James which was lined up for the small screen yet never made it for budgetary constraints ‘Count Magnus’. The sharp angles of Abigail Larson’s artwork make for a real change in style to this well known classic. Larson’s depiction of the horror of Wraxhall as he’s followed is excellent. It was also particularly enjoyable to see a visualisation of the inn keeper’s tale to Wraxhall. The colours by Al Davison are also especially enjoyable on the tones of the sky as the monstrous count pursues his prey. One of our favourite stories of the book has to be the beloved ’Oh Whistle and I’ll Come to you My Lad’. Here the story of Parkins and his unearthing of ancient horrors whilst in Burnstow are stunningly depicted. In particular the wonderful watercolours of Al Davison, who’s vivid moody skies seem to foretell of the horrors to come. The phantom in the sheets is also excellently recreated and it’s worth enjoying the colour tones of the skies. The dream sequence of the pursuit over the beach groins is most certainly worth the asking price of the book. It’s by far and above the most haunting scene in the book. Lastly the excellent ‘Treasure of Abbot Thomas’ as illustrated by Meghan Hetrick. Carrying a much warmer colour palette to the other stories in this book setting a welcome change of style to a still truly horrific tale. The emphasis on the greener shades also amplifying that feeling of something ‘slimy’ being ever ‘all around’ the Reverend Somerton as he releases something vile in the bowels of a well whilst treasure hunting. It’s beautifully illustrated and one which shows the evident amount of work that’s gone into this publication. For any fans of SelfMadeHero or the ghost story this is most certainly a great read, especially for the witching season. We certainly can’t wait to see what’s lined up next for Vol. 3!